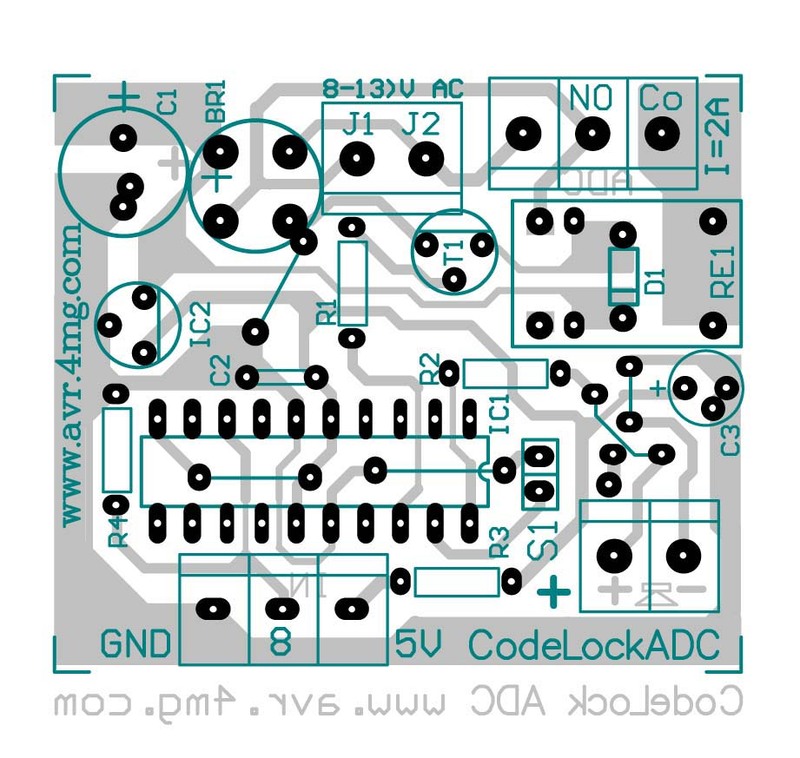 CodeLock AVR electronic combination lock is realised with Atmel AVR microcontroller AT89C2051 or AT90S2313 or ATtiny2313 or ATtiny45. Program in hex code is 2 kB long. One user code (Ver. 1) is consisted of 1 to 8 digits. One user code (Ver. 2.1, 2.2, 2.3) is consisted of 1 to 4 digits. If you buy the chip (Ver. 2.1, 2.2, 2.3) than you can enter 1 or 8 user codes that are consisted of 1 to 9 digits. If the code is entered in the correct sequence, then after 1 second the relay and the electric striker (in the door) switch on for 1 second and then switch off again. User code can be changed via 3x4 matrix keypad. Keypad for CodeLock can be bought at local electronic shop. HEX files ending with -D are demo files. In demo file is allowed to activate a relay up to 50 times. Initial user code (1234) is set up with a jumper. The jumper must be inserted before the voltage (12V) connection. The jumper must be removed after 2 beeps (after 5 to 15 seconds). For LCD display pictures (1 user code version) click here. For LCD display pictures (8 user codes version) click here. Signaling: Each pressed key is immediately confirmed with one short beep. Two short beeps follow after entering the right user code. One long beep appears when entering the wrong user code. The keypad is blocked for 20 seconds for each incorrect action. User code is retained even in the event of a power failure. You can use a LED diode instead of a Beeper. Look at the codelock electric circuit diagram. The third row of the keypad (numbers 7, 8 and 9) can be unpluged. In that way you get 3x3 matrix keypad. If the additional row (the second one) of the keypad is also unpluged you get 3x2 matrix keypad. In that way you can use only: 1, 2, 3, *, 0 and # keys. E-mail in the electronic lock projects below is no longer valid. For CodeLock AVR LT (Ver. 1) electronic lock project downloading click here. Programmed ATtiny2313 (1 user code - 1 to 12 digits - LCD is on) = 6 EUR. Program (1 code-8 digits) codelcdtinyLT.hex for ATtiny2313 => here. Program (1 code-8 digits) codelcdLT.hex for AT90S2313 => here. For CodeLock AVR (Ver. 2.1, 2.2, 2.3) electronic lock project downloading click here. Programmed ATtiny2313 (1 user code - 1 to 12 digits - LCD is on) = 12 EUR. Program (1 code-8 digits) codelcdtiny-D.hex for ATtiny2313 => here. Program (1 code-4 digits) codelcdtiny.hex for ATtiny2313 => here. Program (1 code-8 digits) codelcd-D.hex for AT90S2313 => here. Program (1 code-4 digits) codelcd.hex for AT90S2313 => here. Program (1 code-8 digits) codelcdtinyR-D.hex for ATtiny2313 => here. Program (1 code-4 digits) codelcdtinyR.hex for ATtiny2313 => here. Program (1 code-8 digits) codelcdR-D.hex for AT90S2313 => here. Program (1 code-4 digits) codelcdR.hex for AT90S2313 => here. Program (8 codes-8 digits) codetiny45R8-D.hex for ATtiny45 => here. Program (1 code-4 digits) codetiny45R.hex for ATtiny45 => here. After burning a hex code set FUSE bits. Program (1 code-8 digits) codelcdtinyM-D.hex for ATtiny2313 => here. For CodeLock AVR (Ver. 3) electronic lock project downloading click here. Program codelcdadc.hex for ATtiny26 => here. Program codelcdadc-D.hex for ATtiny26 => here. Program codelcdadc1.hex for ATtiny261 => here. Program codelcdadc1-D.hex for ATtiny261 => here. Programmed ATtiny2313, ATtiny26 (1 user code - 1 to 9 digits - LCD is on) = 12 EUR. Programmed ATtiny2313 (8 user codes - 1 to 9 digits - LCD is on) = 19 EUR. Programmed ATtiny2313, ATtiny45 (8 user codes - 1 to 9 digits - LCD is off) = 12 EUR. Programmed ATtiny2313, ATtiny45 (30 user codes - 1 to 9 digits - LCD is off) = 20 EUR. Programmed ATtiny2313 (10 user cards - LCD is off) = 12 EUR. Programmed ATmega8 or ATmega88 (8, 16, 24 or 32 user cards - LCD is on) = 15 EUR. Post (via registered mail) & Package: 4 - 6 EUR (SI), 4 - 10 EUR (EU), 4 - 10 EUR (OTHER). 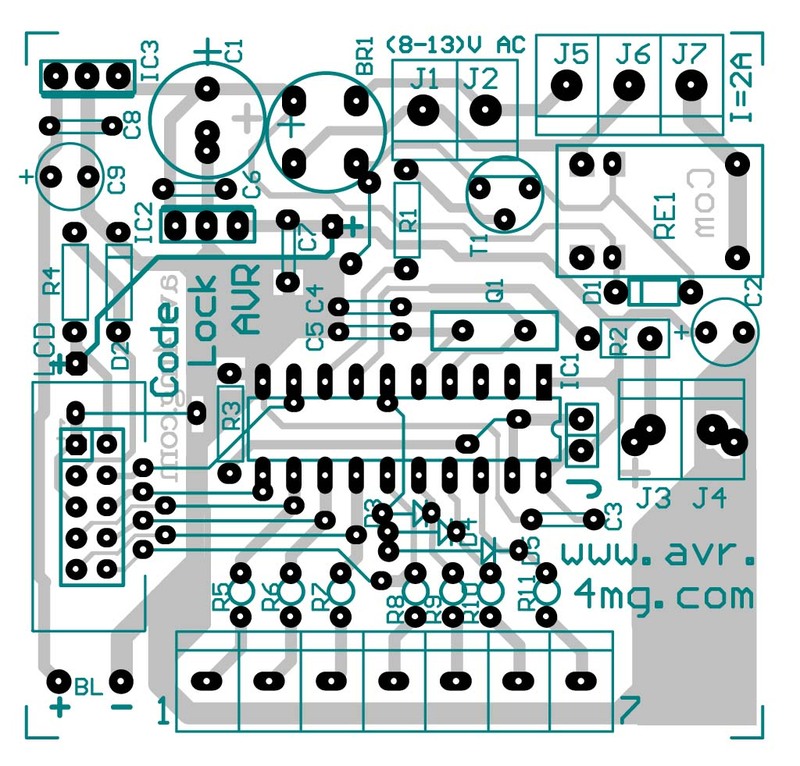 Any question about CodeLock AVR? Just send an e-mail. CodeLockAVR-LCD: The relay RE1 is activated 1 second. CodeLockAVR-LCD-M: The relay RE1 is activated. SwitchOpen deactivates RE1. After 16 seconds the relay RE2 is activated. SwitchClosed deactivates RE2. SwitchBarrier deactivates RE2 and activates RE1. 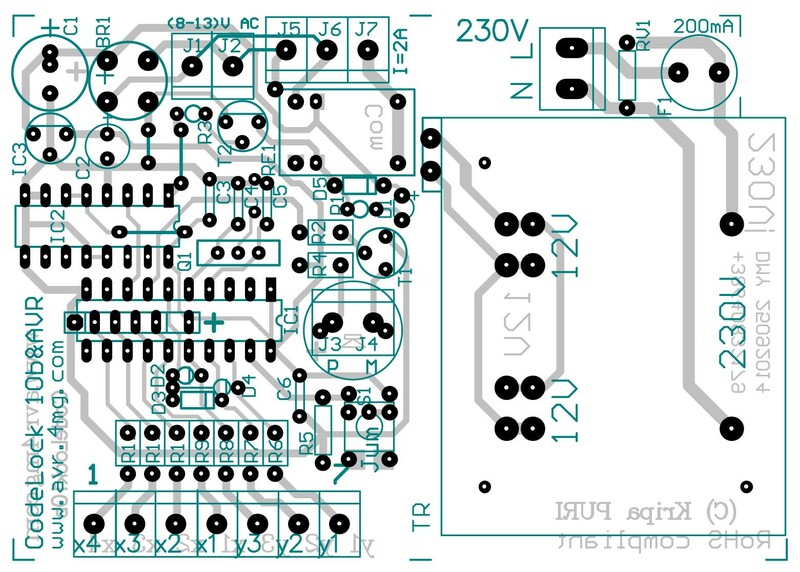 For ATtiny2313 codelcdtiny-D1.bas program downloading click here. For AT90S2313 codelcd-D1.bas program downloading click here. You can test the program on the virtual LCD and keypad in Bascom AVR Simulator. For codelcd-D1SIM.bas program downloading click here. 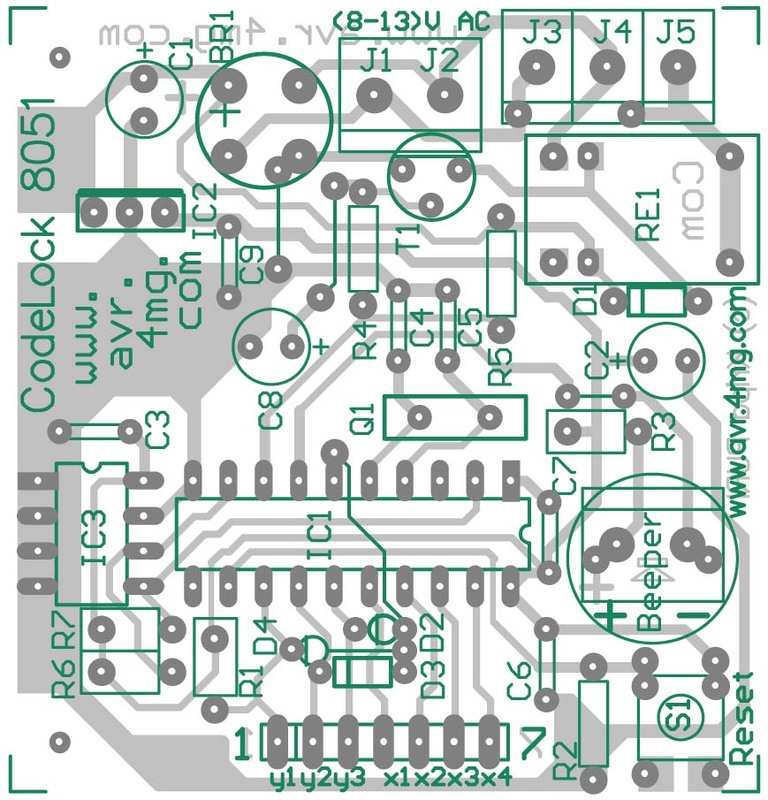 For CodeLock 8051 AT89C2051 electronic lock project downloading click here. For AT89C2051 code11eng.bas program downloading click here. For AT89C2051 code11-1.hex program downloading click here. For AT89C2051 code11-2-D.hex program downloading click here. 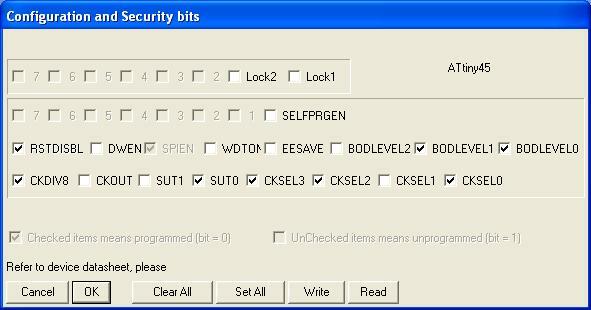 For SmartCard4 Lock AVR electronic lock project downloading click here. For AT90S2313 smart.hex program downloading click here. For ATtiny2313 smarttiny.hex program downloading click here. For AT89C2051 smart8051.hex program downloading click here. 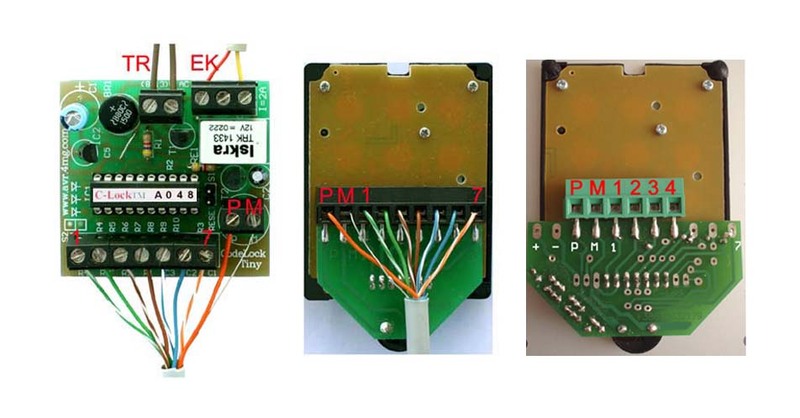 For SmartCard10 Lock AVR electronic lock project downloading click here. For AT90S2313 smart10-D.hex program downloading click here. For ATtiny2313 smart10tiny-D.hex program downloading click here. For SmartCard30 Lock AVR electronic lock project downloading click here(slo) and here(eng). For ATmega8 smart30-D.hex program downloading click here. For ATmega88 smart30mega88-D.hex program downloading click here.